This was the third annual awards poll run by RISCOSitory, along with a survey (results still to be calculated), on the RISC OS Awards website. Continuing the policy started last year, while the poll was nominally for 2015, the period covered was from November 2013 until December 2014, providing a two month overlap. The poll was opened for votes on 9th December, 2015, and was closed on 12th February, 2016, giving people just over two months to make their choices. And in that period, there were 161 valid entries - an increase in the number for both previous polls, with the increase on last year being particularly notable. It seems likely that this was a result of the method used: Whereas last year, voting was via a free-form text field, this year that was combined with a number of nominations, allowing those voting to select one. As before, the whole process has run smoothly. The votes were initially received on a Windows computer, but then transferred to a RISC OS system, on which all of the processing and counting was carried out, using a combination of a small program written in BBC BASIC and Colton Software's Fireworkz. And the results of that processing can be found below - congratulations to all the winners! ArtWorks 2 - the vector graphics package originally from Computer Concepts, now from MW Software. Organizer - the personal information manager from North One. NetSurf - the cross-platform web browser from the NetSurf developers. GCC - a C/C++ compiler from the GCC team. Otter Browser - Chris Gransden's port of an alternative web browser. RiscLua - the RISC OS version of programming language Lua, from Gavin Wraith. Fireworkz 2 - an integrated word processor and spreadsheet from Stuart Swales/Colton Software. An updated version of Ovation - Beebug's DTP package, thanks to Rick Murray. NetSurf, from the NetSurf Developers. Star Fighter 3000, originally from FedNet, now free from Christopher Bazley. Legends of Magic from AmCoG Games. Star Fighter 3000, originally from FedNet and now free from Christopher Bazley. A 105 key mechanical keyboard with red function keys and a cog logo from Elesar Ltd.
ARMX6 - the i.MX6-based computer from R-Comp. RapidO Ig - the IGEPv5-based computer from CJE Micro's. The Titanium motherboard from Elesar Ltd. The Raspberry Pi 2 from the Raspberry Pi Foundation. The Raspberry Pi 2 from the Raspberry Pi Foundation . RPCEmu from Matthew and Peter Howkins. ArchiEmu from Jan de Boer. Development of the Titanium motherboard by Elesar Ltd. The news that Pi-Top will be available with RISC OS from CJE Micro's. UltraHD support coming to R-Comp's ARMX6 computer. Otter Browser being ported to RISC OS by Chris Gransden. The Raspberry Pi Zero from the Raspberry Pi Foundation. The development of Titanium by Elesar Ltd.
RISC OS Open for bounty matching in January 2015. Elesar Ltd for developing the Titanium motherboard. 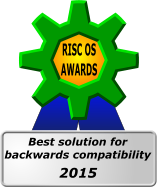 R-Comp for developing PiFi, a WiFi solution for RISC OS. The Archimedes Software Preservation Project by Jon Abbott. The Acorn News Service mailing list. The Archimedes Software Preservation Project forum. 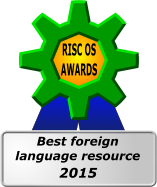 The RISC OS Open forum and source code repository. The Stardot/Stairway to Hell forums. Drag 'n Drop magazine from Christopher Dewhurst. Archive magazine from Abbey Press Glastonbury. GAG-News, the magazine of the German Archimedes Group. The updated Style Guide from RISC OS Open Ltd.
Raspberry Pi RISC OS System Programming by Bruce Smith. Archive Magazine, from Abbey Press. Steffen Huber's RISC OS blog. The Big Ben Club website. 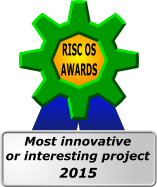 The RISC OS Experience 2015. 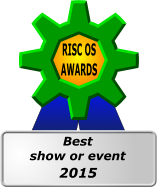 Recursion 2015 incorporating the MUG Show. London 2015, organised by ROUGOL. Martin Hansen's nautical GPS system, demonstrated at RISC OS Southwest 2015. Rasterman from Steve Harrison, offering increased colours on older hardware, demonstrated at Wakefield 2015. Steve Drain's 'tablet' form factor Raspberry Pi, demonstrated at London 2015. The Advanced Music Construction System from 3rd Event Technologies. The Archimedes core for the MiST FPGA board by Stephen Leary. This was the one category that didn't have any nominations, and instead relied on those people voting to suggest which individual, team or company they feel deserves recognition as having made a worthy contribution to RISC OS. Of the 161 valid voting forms received, only 64 voters entered something for this field, and of those 64, one individual was named in almost a third of the entries, with two companies coming second and third with a fifth, and almost a sixth respectively. In third place, with 16% of the vote: RISC OS Open Ltd. In second place, with 20% of the vote: R-Comp. In first place, with 31% of the vote: Jeffrey Lee. David Bradforth for not finishing and publishing his 'A Potted History of Acorn Computers' book, after taking £915 from RISC OS users via an Indiegogo crowdfunding campaign. All the RISC OS users who didn't bother voting in last year's poll! Chris Evans of CJE Micro's, for not making use of the equipment available to him during his show presentations - such as the projector! 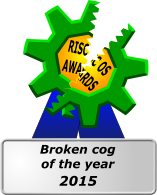 RISCOSitory for a multitude of reasons - such as not announcing last year's poll on the site when it went live, as well as not being prepared and having to make it an open vote. Also for rushing some posts to the site and mangling the English language in the process - and even failing to put a title on one item! 3QD/VirtualAcorn for being particularly unhelpful towards a customer in need of help.